Who doesn’t love toys you can pack up and take with you? Even better when they are crafted from wood and evoke the quality toys of yesteryear. 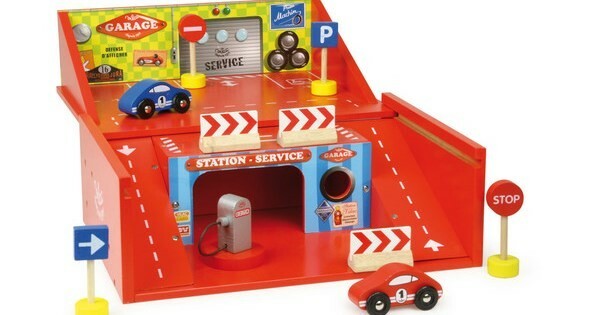 Award-winning French brand Vilac, which has been plying its trade since 1911, have a race track and garage set that are all about stimulating creative play. The race track has enough sections to build different shaped tracks as well as cars. The real neat feature is the sheltered pit stop area that doubles as the suitcase for the set, making it great for toting around wherever needed. The travelling garage in a box ($78) comes complete with accessories including two cars, a fuel pump and hazard signs. There is also a larger fancier two-storey version ($179). Vilac’s thing is wooden toys, so no surprise these sets are crafted from natural wood with a non-toxic paint finish which are easy to wipe down. These look like toys your kids could hand down to their kids. Find them for your crew at Tiny Tiny Shop Shop.